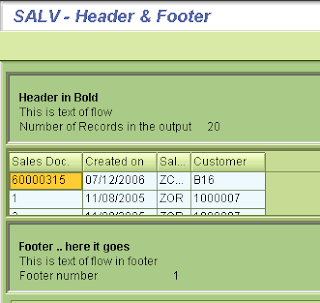 Today we will discuss how to add the Header and Footer using the SALV model. In ALV, header (top-of-page) and footer (end-of-page) play important role in presentation of the data. Header and footer are imortant when we need to print the report and use it for later decisions. Assume the report which has only columns and no information. Does it really define “Information”? – NO. So, let’s get started on how to create Header and Footer. - Use methods of this reference to create a Lables & Flow. - Set this reference into the main ALV object (reference to CL_SALV_TABLE). Labels are useful to generate the text output in intensified or Bold letters. This can be used to print the Header, like – Sales Revenue Report. We can also use this kind of lables in the Footer section to highlight the total amount of all orders – for example. 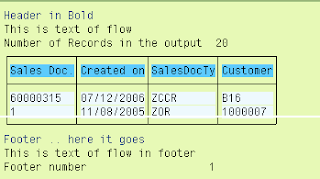 Flow is useful to dispaly the information in the tabular format. This flow can be used to display the Selection parameters, selected rows etc. lo_h_flow  TYPE REF TO cl_salv_form_layout_flow. lo_h_label = lo_header->create_label( row = 1 column = 1 ). lo_h_label->set_text( 'Header in Bold' ). lo_h_flow = lo_header->create_flow( row = 2  column = 1 ). lo_h_flow->create_text( text = 'This is text of flow' ). lo_h_flow = lo_header->create_flow( row = 3  column = 1 ). lo_h_flow->create_text( text = 'Number of Records in the output' ). lo_h_flow = lo_header->create_flow( row = 3  column = 2 ). lo_h_flow->create_text( text = 20 ). *   set the top of list using the header for Online. *   set the top of list using the header for Print. lo_f_flow  TYPE REF TO cl_salv_form_layout_flow. lo_f_label = lo_footer->create_label( row = 1 column = 1 ). lo_f_label->set_text( 'Footer .. here it goes' ). lo_f_flow = lo_footer->create_flow( row = 2  column = 1 ). lo_f_flow->create_text( text = 'This is text of flow in footer' ). lo_f_flow = lo_footer->create_flow( row = 3  column = 1 ). lo_f_flow->create_text( text = 'Footer number' ). lo_f_flow = lo_footer->create_flow( row = 3  column = 2 ). lo_f_flow->create_text( text = 1 ). Try to add the blank line. Hats off Naimesh. Nice blog. Does this work if you CL_SALV_TABLE is not in fullscreen mode – but inside a container? If I put it in a docking container the header doesn't appear. Unfortunatly, this doesn't work with Grid ALV. What ever Field is displaying in ALV is from table , if in case i want to use my own defined Field in ALV. How to manage that in Field Catalog? how to increase the size of header??? thank you for your example. I have a question though: I would like to add a logo in the header, unfortunately I did not make it, maybe you have an idea? You have asked: I have a question though: I would like to add a logo in the header, unfortunately I did not make it, maybe you have an idea? i like your blog, is very important. but cann you help me please. I would like to make an upload of a picture/logo to use in ALV (with OO) report (Header)!!! I know It is possible but I don´t remember how to do this!! Can you help me?? 1. When I generate the ALV with the look&feel; of an ALV Grid, whenever I want to print, it prints in the ALV list format. I am assuming that this is inpossible to overcome. Am I right? 2. When I print the ALV, it generates an ALV list and sends it to spool with left margin zero. Is it possible to add suppose 1-2 CM of left margin? 3. Is it possible to define the page size of the ALV List that will be sent to spool, and display the page number on header? 1. ALV Grid Print – No. System will always generate a List for printing. The ALV Grid is more for better interaction. 2. Margin on Left while printing – I am not sure if it possible or not..
3a. Page Size – Yes. we can set the pagesize while generating the ALV. Check the program BCALV_TEST_GRID_PRINT. You need to use the FM SET_PRINT_PARAMETERS to set the print parameters. 3b. Page Number – You can use the Event PRINT_TOP_OF_LIST to print the Page Number.